Within this past week I've come across several stories of sailors who found themselves in a boat that was either sinking or severely damaged, leaving them stranded in the middle of the ocean. One story was of three young men that were stranded for 50 days after their motor broke down, another was of a young woman from my home town (New Orleans) that lost her father on a passage to Bermuda when their sailboat was overturned by a huge wave, and another was about a man who survived on his life raft for 67 days after his sailboat was damaged by a large wave. The last story was on the National Geographic Channel this past week, and I believe the events took place a while back. However, while watching the tv show I started wondering about what we should have on our sailboat once we start cruising. When Ken and I first started thinking about cruising, I started researching the internet and was reading anything I could find about cruising. In my search I came across a few articles that mentioned having an emergency kit and a life raft in the event the sailboat capsized. We have some time to prepare, so we're not making these type of purchases just yet. However, while I was watching the tv show I did start thinking about what we should have on our sailboat in case of an emergency. The man on the television show survived on a covered life raft, along with an emergency kit that he had packed. I don't know exactly what this man had, but he did have a couple cans of water, a couple cans of food, a knife, a large fork, some flares, and three solar stills (which took him over 10 days to figure out how to use them). For loved ones that think we're nuts, Ken and I do NOT plan on long overnight passages (for the reasons above), and DO plan on cruising the coast as much as possible! We take comfort in the fact that we won't be far from civilization, and therefore should not be too far from help. We also plan on always wearing the proper safety gear and keeping ourselves "attached" to our sailboat when necessary. We'd love to hear the thoughts of other boaters, and what they think is a "must-have" for emergency preparation. Hasta luego ... until then. Mid-Life Cruising! Well, we do plan to cross Oceans so we "need" a lot of the bigger stuff you speak of...we have a 6 person Switlik Offshore life raft, an ACR EPRIB, a long-range SSB radio, an INMARSAT satellite phone and a "ditch bag" in which we carry basic survival gear; fishing line and hooks, mirror, mylar 'blankets', flashlights, a can opener, small medical kit....etc. We plan to add more to it as we go. Safety is NOT cheap, but it is well worth the peace of mind! Good luck! We don't go sailing in the ocean. It's too dangerous in our opinion. We'll go out the San Francisco Golden Gate Bridge but we want to see land at all times. We have and wear life vests at all times when under power. We don't have a raft, but should. We have a radio and know how to use it in case of emergency. I'm sure there are plenty of resources to assist you in having the right emergency equipment to keep you as safe a possible. Being close to land doesnt mean too much, as a guy sank in the English channel ( how much closer to land on two sides of you can you get) and was found in his liferaft off Rio I believe, about 4000 miles away I forget his name! Important things are an easily deployable liferaft ( of the correct type) with an inflatable floor an Epirp of the correct frequency, a suitably filled grab bag! ( there are many suggestions to be found on the net forums, most will never ever be used) warm clothing (even easily accessable immersion suits) solar stills, more than one as it will get washed away eventually, or punctured, maybe a small emergency pump type water maker will do the trick (unused ex military solar stills used to be available on the net? ) when the weather gets Really bad climb into your immersion suit and fight through it! 99.9999r% you will get through it, as it doesn`t last for ever! mostly its wind, noise and bumpy water, deploy a sea anchor put on your nav lights, learn to "heave" to, early on in your sailing career, along with the quick and efficient deployment and retreval of a sea anchor, some use retired (ex military once again) equipment chutes ( of a suitable size) with plenty of anti chafe on the line, which incidently needs to be long enough to situate your drogue in the water (with its fender afixed to the rim of it to keep it from sinking) three large waves away from the boat so quite long) to it where it passes through the fairlead. also on the line leading from the cockpit winch to the block, that allows you can alter the angle of the boat to the sea (the block being located to run free along the drogues tether line. Thanks everybody for your input! Since we're waiting to sell our house we're not purchasing these things just yet, but safety is important and we will come back to this post when ready. Sailboats are usually pretty safe. Of the millions of miles logged only a few wrecks actually occur. Opinions are like... well you know. Rob nails it on the head. Being near shore is no indicator of safety and each cruiser will have to know or be ready to learn how to react to dangerous situations. Note; The days of long rides in a raft are pretty much in the past with EPIRB technology the way it is. Get a new one that has all the bells and whistles. I went to paratech for my drogue and sea anchor, it was about $700.00. My life raft was purchased in the UK (Half price compared to U.S.). The sea anchor was the best safety purchase I made. 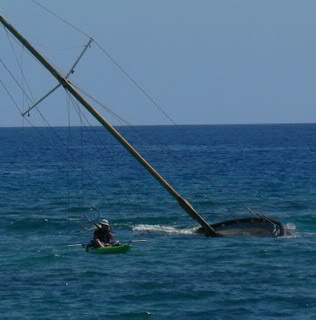 The sea anchor held for 36 hours off the coast of Mauritania in 40+ knots of wind. We were able to retrieve it and repack for futher use, but I never had to use it again. It rests in the garage waiting for the next open ocean cruise. Make up a ditch bag with GPS, VHF, Iridium, EPIRB, copies of passports, credit card numbers, canteens of water, mirrors, etc. Pretend like the ditch bag is all you will have because if you are having bad luck, count on it being really bad. That means no raft because the boat sank under your feet! My last trip I wore my personal EPIRB clipped to my person along with a laser signaling device. Final comment: Each cruiser will decide what is affordable or necessary for survival. Personal flotation and signaling devices are the most important survival aids as most cruisers are within hailing distance to rescue or assistance.